Leather Cinch is fully adjustable to fit all size. 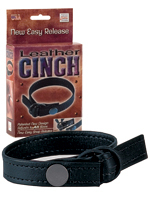 Slip into this comfortable, easy-to-use newly designed Leather Cinch. Use convenient quick release snap for easy removal.